Turning off "Remote Differential Compression"
One of the first suggestions that I came across was to turn off this Windows Feature in Windows 7. This suggestion is common on the web but it turns out to be just a myth. This is 100% false. Neither Windows Update or file copy operations use RDC at all. So I ignored this suggestion and continued looking. This is another common suggestion that I came across and it uses NETSH command-line utility used for displaying and modifying the network configuration. To make the necessary changes, we need to run that utility as an Administrator. 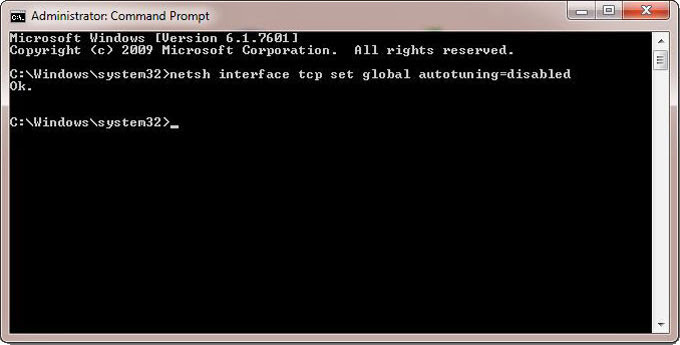 This suggestion still didn't solve my problem, so I looked further, but before doing that I wanted to set Auto-tuning back to the default value by typing netsh interface tcp set global autotuning=normal in the Command Prompt (running as an Administrator). In this post we examined different ways to solve slow speed on a LAN network. One of them is just a common myth, but for other two you need to have administrator privileges. I hope you found this article useful. Consider sharing it on a social networks. Comments are also welcome. If you solved your slow LAN speed problem in a different way, let me know how and I might add that solution to the list. After months enduring a terribly slow transfer between two win7 computers, after having reinstalled the OS, turn off all firewalls, all anti-virus and even reinstalled all LAN card drivers, I could not solve this issue. Transfering a 500K file could take up to 15 minutes !!! After disabling the LSO on both computers (no need for reboot), the transfert took less than 1 second. This article is for those cases when LAN speed is really slow (like 20kb/s). You probably have a different issue. I Hope everyone will red this post. So I tried the above and network transfers still 10.5 MBs went into my router and was fishing around and found that I didn't have QoS turned on after turning it on, I went from 10MBs to 80MBs hope this will help out others good luck. Actually this worked for windows 8 too with speeds @1mb/s. At first i got around 20-30mb/s, then dropped @1mb/s, and now after disabling LSO, finally works @85mb/s. Kinda like asking "If I take off the wheels on my car, and drain my gas tank, the car will be lighter! So, it will go faster, right?" Funny, I'm trying to see what you mean. Keep in mind, the data has the ability to flow. The car you mentioned can not move now. Wouldn't it be better to say "after I realized I needed to press the gas more, the car went faster". That is a bad analogy too but I did not prevent the car from moving. Mate, it worked like a charm for me also without a restart so thank you very much. Just makes me wonder why this setting has caused me this problem when it never has before? Oh well, it's working now and I don't have time to ponder that. hey, I woud like to thank you, but it not solve my problem. Do you have any other idea? I have 2 pc with win 7 home. The lan speed of connetcion is below 2 Mb/s. Try booting from "Safe Mode with Networking" to see if some third party software is not the cause of the problem. Another possibility could be a defective cable. Enable the "Jumbo packet" to highest value for solving the issue. Same issue as Adam: srv2003SP2 and 24 pc, mixed XP and 7 = super slow network...my customer is about to kill me ! Iam also facing similar issues , between 8.1 OS and windows 7 , where the speed is about 8mbps but cant we make it to more than 20 ? Thank you! Your last suggestion worked in the midst of a Windows Easy Transfer. Network utilization was less than 1percent on two Windows 7 64-bit machines. After, it jumped past 60 percent and stayed there on both machines. Thank you so much for sharing this info. this article saves me. thanks a lot!!! You just made my day! Thanks so much. After stuffing around for nearly a full day without success I finally landed on this site and B I N G O !!! I still do not know what caused the problem but it appeared immediately after installing a new Internet Security Software on all Workstations. Thank you again. This worked wonders. I had my Pictures folder (40 GB) that I needed to transfer to the new 3 TB drive located on another networked computer. It at first said 19 hours, but after this fix it's down to 8 hours. I still think that's too slow, but it dropped to half so thanks for that. Wait, your comment is from 5 years ago.. maybe technology improved since then, but again, my laptop is an old lenovo, i belive 2014-2015.. Thanks for the info. Definitely helped. God! it's awesome thank you! till now i was like using an usb drive to move file between my comps now i can copy! i can COPY, my speed was like 5k and now it's 5mb! thank you ! Had the same problem. My network server is XP machine. My new (used) laptop is Win7. The "Jumbo Packet" setting did not solve the problem. I solved it by changing the "speed/duplex" setting in the advanced tab of the XP server's network card properties to "Full Autonegotiation". It had been set on "Force 100" My speed went from about 150kB to 10Mbyte. So wrong on so many levels.. Your not getting 100MB, changing the duplex to full negotiation would only help if you have a high speed than 100MB (1,000). I can't belive, that works on W8.1. I Had the same problem, disabled "green ethernet" and fixed the problem. 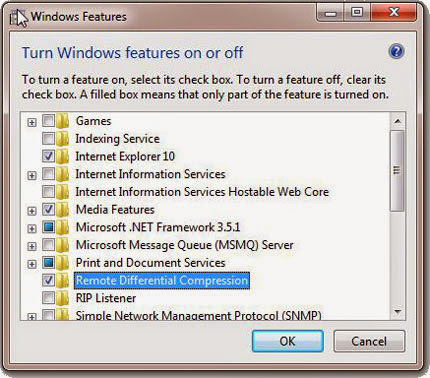 Disabling the LSO on our Windows Server 2012 fixed the problem for us. Off the hook ! Thanks a million ! It must have taken you hours and hours and hours to find a solution. Finally a solution which works! Man I have had this issue for a long time. I thought that I have tried everything to pickup my LAN file transfer speed and nothing worked. Till now. I disabled LSO and WOW! Even large files transfer in seconds. Thank you very much for sharing this info. Bravo!! The LSO solution worked like a charm. Disabling LSO for IPv4 reduced of 3% my bandwidth so I kept it on. I'm sorry, I've tried all the solutions, unfortunately, my problem continues .. I also had 1 MB LAN transfer speed and found one thing that helped ! Try disabling IPv6 - now it's around 80 MB per sec. I have 3 PCs. PC1 is our server PC with a practice management program. I have mapped the drivers of the 2 workstation PCs to the server PC for full access of the program (read and write). I have turned off LSO and network speed has improved but only when one workstation is on at a time, when both workstations are on, network speed is slow. Does anyone know what else could be the issue? Have I mapped the drivers wrong? Do I need to reset my modem? Boosted LAN transfer from 355kbps to 10Mpbs. Thank you! Wow, changed settings in the middle of a copying files. Estimated time started at over a day and dropped to mater of about 20 minutes. Worked great make sure not to forget the reboot. leave it to microsoft to have a feature for really slow file transfer. Tried looking for this option on my windows 8 machine, and don't see the options listed under the advanced tab when I double click on my network adapter, could it be stashed somewhere else? Called something else? When using Acronis True Image, to back up to server daily (around 200GB) I used to get around 55%-75% (up to 750Mbps) network utilization on a 1Gbps LAN, both card are running at full duplex 1Gbps. However for some reason the speed will not cross the 50% threshold? Only thing that's changed is the addition of a micro SATA SSD as the boot drive. My transfer speeds just went from 6mb/s to 90mb/s!!!!!!!! Thank you sooooo much. Now I just need that fast speed out of my wifi. Is there a trick to that too? Hey, thanks for this, but I still have the same problem. 1MB/s over a 100Mb/s .. other ideas? After doing all the steps, issue not resolved can tell me other way. It worked for me although in my case the v2 options were already set to disabled and the non-v2 option "large send offload (IPv4)" was enabled. Changing this to disabled on my Vista and windows 7 laptops connected by a cat cable increased the adaptor usage from 2% to 99% after I restarted the download. If TCP and UDP Checksum Offload are enabled try disabling them and see if that does the trick. I have something different - "Task Offload" in my Atheros L1 Gigabit card, Should this be done on both computers or just the sending one? Assumed both. Thank you so very much. Its working as if my network is on Steroids. I have a NAS connected to my network and only the top folder would connect and the rest of the folders would take up to 15 seconds to give me the log-in window, now, it doesn't even take a second. I appreciate you writing this up! It appears to be the answer to my problems as well. The only question is, I have 300 workstation... Is there any way for a Group Policy to be made for this so that I don't have to visit 300 workstations? 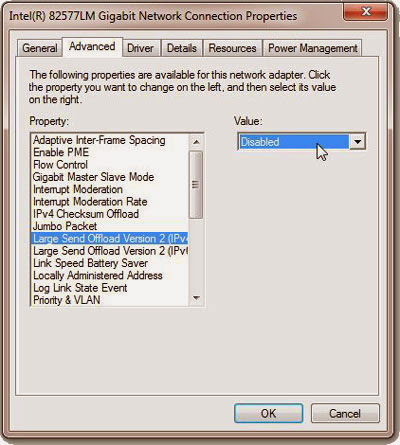 Check the article below which contains steps for Disabling Large Send Offload with Group Policy Preferences. Maybe this is what you are looking for. The Offload setting fixed my Windows copy speed! Funny though, if you use a different copy manager like TeraCopy, speed was pretty good. Wow! This worked "like a charm (Quote from "Santoxthanksyou" above)"! Thank you... wish I'd seen this article a couple years ago... changes the way I operate my home network -- so very much for-the-better. I followed your steps exactly for both computers (the third suggestion, the one that worked, the "LOS" option) -- didn't even have to re-boot (but will do it anyway) before this put the transfer speed "on Steroids (Quote from "Brian" above)." Thanks for posting this. I put a Netgear NAS on my home network a few months ago and have had faster access over WiFi than Ethernet (over Ethernet it could take 12 hours to import a CD into my iTunes library on the NAS). Using JDSU, I was able to see that the problem was the number of re-transmission, but only from the pc to the NAS, not the other way around. I had to both disable LSO and enable jumbo frames to get the performance improvement, but importing a CD now only takes a couple of minutes. I get to step 5 and instead there is no list of options under the advanced tab... Just a button "nvidia Ethernet configuration" which when I open it lists some options but not the LSO option... I can't seem to fix my problem. I tried all 3 options but the speed just around 300k. I tried to get into the network adapter setting and find the "Link Speed" is set to "100mb Full Duplex", so I set to "1.0Gbps full Duplex", after 20 secs network adapter re-fresh, then the download speed upto more than 10mb or above per second. Some time ago I experienced a slow connection when transferring large files. After I disabled large send offload on my networkcard ( killer e2200 gigabit ethernet controller (ndis 6.30)) it worked again. Since yesterday I have a slow connection again. 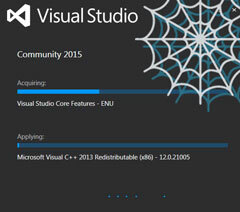 I didn't install something new and LSO is still disabled. Thank You so much, unbelievable how much differnce this change made. Thank you for the info.I really helped was struggling with slow lan for 4 days nothing helped but these changes made wonders..
OMG! Can't believe this. Disabling LSO increased my speeds from 4MB/s to 40MB/s. 10x the speed! Saved the day for me. I had 1MB/s speed on my Win7 computer, after disabling LSO the speed went from 1Mbps to 70 Mbps. Thanks a lot for sharing the solution. I was transferring data over LAN between 2 laptops one of which is Windows 7 and another is Windows 8.1 at speed of approx 1.30 MB/s. I tried ll your suggestions to increase speed. But the speed reduced to kb/s. I just wanted to chime in and express my gratitude for this solution. I've been suffering speeds of 300 kb/sec at the max, trying all the Windows troubleshooters and everything else that they officially recommended. Disabling these Large Send Offload things increased my speed to 30 mb/sec. I tried these without much luck. What ended up fixing it for me on my troubled workstation was the network card was set to a static 100Mbps & Full Duplex instead of auto negotiate. Turned on autonegotiation and bingo. I think I might owe you something huge for this, but have nothing to offer. 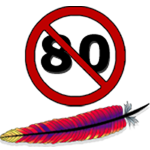 Please note that, for me, the solution required disabling of all of LSO (IPV4), LSO V2 (IPV4), and LSO V2 (IPV6). This brings about the end of a very long-term frustration. Many thanks for this post. You deserve an award or something. Excellent! Thank you very much. It was one older computer on our network that was slowing down other resources. After disabling LSO on that station it has helped all around. I did the opposite. I enabled Jumbo Packets, the largest size. That fixed the problem. I was getting 100KB/s before the change, and after I am getting 12MB/s. However, my case is special. I am downloading over a university campus LAN. My XP network is very slow until I disable and enable network! Why? This can be caused by Bonjour service. If you have that service running, check this article on how to remove it. On the LAN the LSO worked wonders. Thank you, thank you and thank you. Any ideas how to fix slow speed transfer over VPN? I know to some degree the speed is reliant on the VPN provider. Waiting anywhere between 12hours and 18 hours is way to slow for a 20gig file. I am getting speeds of 434kb or less. I have disabled LSO IPv4 and IPv6 on both the remote computer and the local computer but speed is the same. Very slow. Check this article. It has quite a few suggestions on how to fix slow VPN speed. Thank you for replying. For some reason it does not open. I will have to try from home. it set between 2 MB/s and 3 MB/s . two laptops wired by lan directly WIN 10 64bit both laptops . For years I struggled with slow speeds thinking that it supposed to be like that. In addition to fixing NIC drivers and disabling green ethernet and LSO, I had relatively slow transfer speeds of about 15MB/s between one Windows 7 and one Windows 10 PC connected using 1GbE NIC interfaces. After using TCP optimizer [http://www.speedguide.net/files/TCPOptimizer.exe] on both the machines with "Optimal" settings, I now get about 80MB/s. The same two PC's running on Linux (one Fedora 23 and one Lubuntu), gives 111MB/s. My Intel NIC doesn't have Large Send Offload option....!!! By default it was Disabled..!! Driver will disable Large Send Offload (IPv4) after user enables this feature, TCP/IP could has better performance if it use jumbo frame without large send. 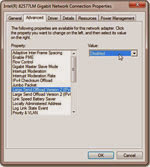 If users enable both of them, the driver automatically chooses Jumbo Packet. Thank you very much for this solution, transfers one way were down to 10-20kb/sec when they were at gigabit the other way. Now both directions work. What a stupid feature. Thanks so much! The large send offload was my problem too transferring files between Windows 8 computers, only in one direction (wireless to wired). Now I'm maxing out my wifi again. Disabling Large Send Offload on both win 7 machines worked like a charm - thanks man! Thanks a million! My file transfer speed over an ethernet cable was awfully slow. About 25kbps. I did 'netsh' change and it boosted up to 8mbps. Then I advanced and did the 'ipv4 and ipv6' changes on both of my laptops. Voila! 71mbps, without a restart.. But as soon as I opened another folder in the file explorer of my sending laptop, the speed dropped to around 46mbps, and the laptop started lagging and hanging. When I let things get stable, everything was back to normal. After everything, I reverted the settings everywhere, to avoid falling prey to anything fishy, should a problem decide to approach me in the future. Hi, Frendz it Did't work for me any other solution plz rfr. From 1 to 11, though slow, but much better than earlier. Thanks a ton. Thanks for this article, though, I wanted the transfer speed to be above 100mb but it became better after following the steps provided in this article. THANK YOU!!!!!!!!!!!!! my god.. from 8mbit to 4-600mbit just like that.. and I have been living with that slow network for ages... feeling pretty damn stupid, why didn't I check this out before. Well anyhow thank you VERY much! I'm having the same issue but on wireless network, there is no such option "Large Send Offload V2 (IPv4)" in Wireless network adapter's Advanced tab. what to do??? 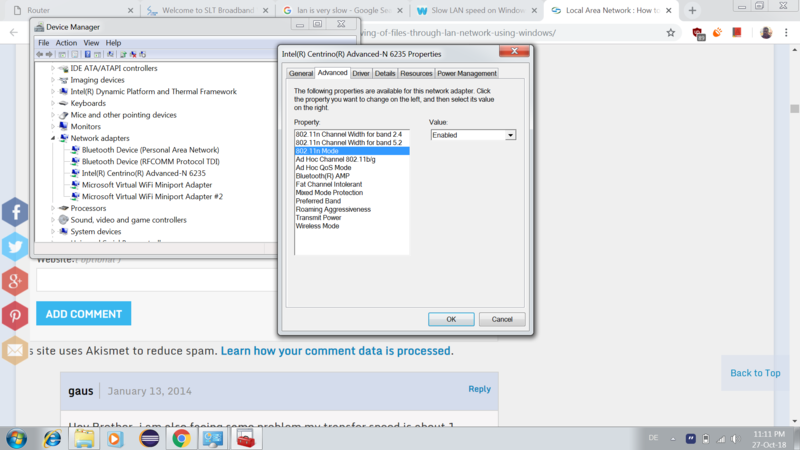 One other setting that is recommend to be disabled/uninstalled is the SMB 1.0 under windows features. This only started two weeks ago after having good speeds for years. Thank you so much. I would not have found this without help. This is my email, someone can help me by sending me a reply to this e-mail, thanks ! O.M.G. Transfer that was at its fastest going 16MB/s and multiple times dipped down as low as 300KB/s suddenly shot up to 46.7 MB/s and stayed jammed there for the duration of the copy process. Amazing and thank you! And curses to the buffoons who invented it, who improperly implemented it, and who decided to enable it by default. I wish to transfer 400GB files from Windows 7 to Windows 10. I have tried the above-mentioned solutions.. Thank you so much for this! I can't believe your first fix worked for me. My connection was literally taking 30 minutes per photo.